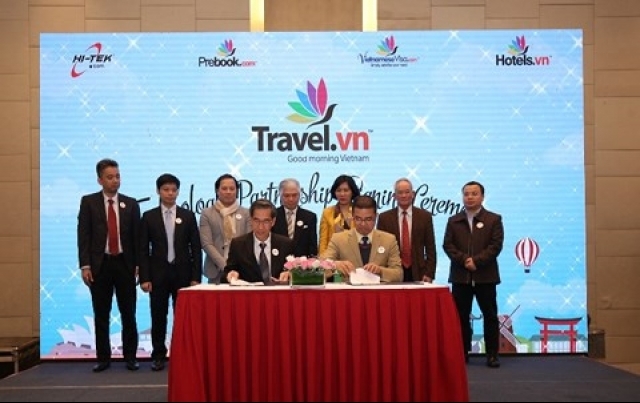 A one-stop-shopping website on tourism in Vietnam has been officially launched by HI-TEK Inc. through travel.vn, hotel.vn, vietnamesevisa.com, and prebook.com. Using Blockchain 4.0 technology, the system connects to more than 800,000 hotels and some 150,000 air flights worldwide at www.travel.vn and www.hotels.vn, allowing travelers to book hotel rooms in and air tickets to Vietnam online at the best price. Those who register as members of www.preBook.com will also receive a 75 per cent discount. The US-based HI-TEK Inc. has also cooperated with Vietnamese embassies in the US and elsewhere to provide visa services for those coming to Vietnam, with a simple and convenient process available at www.vietnamesevisa.com. HI-TEK will continue to build and complete its booking system for cruises, online ticket purchases for entertainment and culture, and car rentals, aiming to add more services to the system and promote Vietnamese tourism throughout the world. In 2018, HI-TEK targets building a direct payment portal to reduce intermediate fees to save costs for tourists. It will also encourage visits to Vietnam by, especially, the more than 2 million Vietnamese living in the US, with lending support from the HI-TEK Travel Bank. Vietnam ranked 17th among countries with the highest internet use in the world, with 53 per cent of its population using the internet every day, according to HI-TEK. Additionally, up to 90 per cent of visitors coming to Vietnam do their search for tourism information on the internet. This provides an advantage for tourism companies to develop smart tourism, based on the achievements of the fourth industrial revolution (Industry 4.0). Vietnam welcomed a record of nearly 13 million foreign visitors in 2017, a year-on-year increase of 29.1 per cent, according to the Vietnam National Administration of Tourism. It also hosted 73 million domestic travelers, up 27.5 per cent against 2016. Total revenue from tourism was estimated at over VND510 trillion ($22.4 billion), with 58 per cent coming from foreign visitors. Travelers normally make room and flight bookings through foreign online tourism agencies (OTAs) operating in Vietnam, including agoda.com, booking.com, TripAdvisor, and Airbnb. There are also local firms in the market, such as ivivu.com, gotadi.com, chudu24h.com, and vntrip.vn. HI-TEK Inc. is a privately-held company with offices in San Diego, Ho Chi Minh City, and Vientiane, the capital of Laos. Since 1995, it has successfully designed and developed numerous innovative interactive e-commerce website portals to promote travel, tourism, and internet services worldwide.